Our Brain is a biological computer hardware with a bundles of data transfers and works as a motherboard with chips, transistors and display through our eyes. A computer can be controlled by human, however, the best thing about human is that you can control, change yourself and your life, surroundings. When you were in a complete confusion, the whole science & philosophy are researching on what is the reason behind a creation of confusion. Well, the answer is very simple. The corpus callosum is composed of 200 million axons (nerve fibers) that allows the two sides of your brain to communicate and create a useful view of the world. An intelligent person has a very good use of corpus callosum. It has a bundle of neural wires like a computer data transfer wires. It transfers motor, sensory and cognitive information between two hemispheres. The corpus callosum is the largest collection of white matter within the brain, and it has a high myelin content. Myelin is a fatty, protective coating around nerves that facilitates quicker transmission of information. White matter should not be confused with gray matter. The brain uses gray matter for computation, thinking, memory storage, and more. White matter, like the corpus callosum, allows different parts of the brain to communicate with each other. Myelin sheath is a biological hardware that is added to improve data transfer. 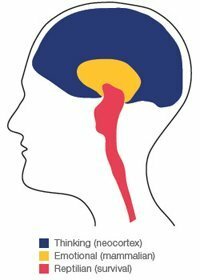 THINKING BRAIN (NEO-CORTEX): NEO Brain, is the most advanced brain and each time we challenge our thinking brain to understand why we feel upset, we also become smarter in the way we act and respond to stress. Each coping success brings great er confidence that tells us we CAN get over our next upset more easily. It gives a know and name of what emotional experience we’ve now (like happiness, sadness). EMOTIONAL BRAIN (Mammalian Brain): EMO Brain is small in size, but very important into emotional attachments to others. Compassion, Forgiveness stands here. We need EMO brain to our judgement, attitude, preferences. REPTILIAN BRAIN (SURVIVAL Brain): REP Brain is a primitive, powerful brain structure and present in all forms of life reptiles, mammals, even in human. Without it, we would not survive. To a threat, It’s instinctive nature, always decides to fight or take a flight, a very survival brain. It is simply because of these functions, that makes people confuse through senses that receives information. while making judgement, polar thinking and decision accordingly, will give you most out of your desire. everyone does polar thinking and you have to. then, what is the best judgement? is there any such judgement? yes, there is optimum judgement or wise decision. it is to use both the brain parts.